That&apos;s right; bacon now comes on a stick. Figure Eight has created a unique twist to the Sunday morning classic. The thick appetizer is drizzled in pure maple syrup, spiced with cracked pepper and is served bite-sized on a wooden skewer. What&apos;s great about this taste bud teaser is that it has a rich, savory kick of flavor that melts in your mouth. I couldn&apos;t eat it fast enough. Even thinking about it now makes my mouth water. Figure Eight brews a creamy stout, Raven Tor, which holds just a hint of chocolate malt that pairs perfectly with the bacon. Realistically, chocolate and bacon can never make a bad pairing. When you combine two good things, the result is always something even greater. Think of Brad Pitt and Angelina Jolie. That result was baby Shiloh. Consider that as point proven. Nothing sings the return of warm weather like the rebirth of avocado season. 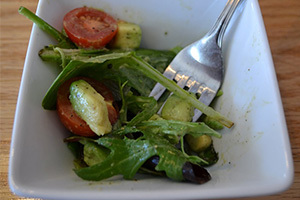 The culinary master at Figure Eight, Nathan Burkett, has dedicated a whole salad to avocado that mingles with the occasional bit of lettuce, red onion, baby tomato and chopped lemon. The energizing munch is light, refreshing and it comes covered with a splash of homemade citrus vinaigrette. Figure Eight will actually substitute the chopped lemon of the salad with the current seasonal fruit being harvested, allowing the salad to always remain a fresh bite because it changes slightly as spring turns into summer. Figure Eight recommends their Lost Saint be ordered with the avocado salad. This Belgian Saison, brewed with coriander and white pepper, evens out the whirlwind of flavors from the refreshing salad. Call me old-fashioned, but I&apos;ve always found myself hands deep in beef tacos. It&apos;s just the way I was raised, so I went into Figure Eight unsure of what a pork taco may bring to my preconceived notions. The pork tacos come on a corn tortilla with a large piece of pepper jack cheese and are topped with cilantro and onion. It doesn&apos;t seem like anything revolutionary at first until you read the description of how the pork is prepared. The pork is glazed in root beer. Let me repeat-glazed in root beer! I just about lost my mind mid-way through the meal. 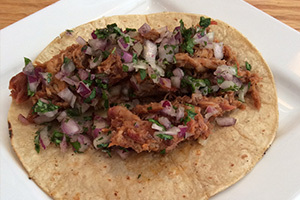 There&apos;s a heat that comes with these tacos because the pork is also seasoned with cayenne pepper. Add the light heat from the pepper jack cheese to the mix and you might find yourself in need of a refreshing drink. An IPA was recommended to pair with the tacos because the hoppy-ness of the IPA can cut through the smoky sweetness of the pork tacos, but in a good way. Figure Eight also brews their own root beer, which is something to obviously consider ordering with the pork tacos. What makes their root beer special is they add the perfect hint of honey to the soda. The honey adds just enough flavor that it could make Winnie the Pooh fall out of his tree. The final entrée of the afternoon was a hearty dish of chicken and risotto. 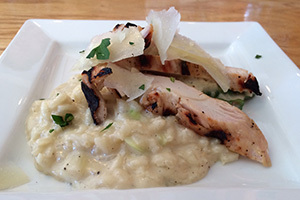 The grilled chicken, which had a fresh citrus flavor, comes garnished with shaved parmesan, asparagus and a healthy amount of risotto. The creamy buttered sauce is not in the least bit overwhelming, but I found myself with yet another craving for an original drink. What could accompany grilled chicken and creamy risotto? "Something hoppy," purveyor Davey said. Snake Pro is a double India Pale Ale that is fruity and full of hops. The double IPA mixes flavors well with the grilled chicken, not clashing with the entrée in the least bit. It was sad to see the last dish be hauled away from the table. "When will I see you again?" was the only internal monologue my brain had the capacity to think. It&apos;s not like Figure Eight is located across an ocean. That would be heartbreaking. Rather, I can visit Figure Eight whenever my heart desires and you can too! Figure Eight is located at 150 South Washington St., Valparaiso, Indiana. 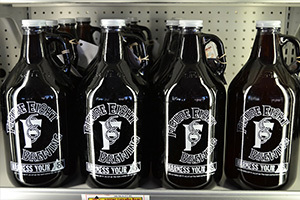 You can also visit them at figureeightbrewing.com to learn a little more about their beers, food offerings and who they are!